The Short Version: Jenn B., aka The Queen of Dating, rules at bringing people together in romantic settings. The former teacher got her start in the dating industry by organizing speed dating and singles events across Sacramento. The success of these events motivated her to offer more valuable dating services, including dating coaching, wardrobe consultations, and date-planning assistance. Over the years, many local news shows have taken note of Jenn’s well-spoken and charismatic counseling and featured her in televised segments about love, dating, and relationships. Jenn feels honored to partner with movers and shakers across California and looks forward to using such opportunities to spread her message of hope to daters everywhere. In 2012, Jenn B. became known as The Queen of Dating not out of ambition, but out of necessity. She decided to pursue a career in the dating industry because she hated the dating scene in Sacramento and wanted to fix it. Jenn B., aka the Queen of Dating, founded a personalized dating company in Sacramento. Although she’d never started a business before — her master’s degree is in special education — she felt personally motivated to do something to help singles, like herself, date more successfully in California. So Jenn began hosting social events, running coaching sessions, and offering concierge dating services to anyone who could use a helping hand in the love department. Over time, local television shows featured her advice, the Learning Exchange offered her Dating 101 courses, and the Got Milk? campaign tapped her to be its Northern California spokesperson for their new Love Stories campaign — which focuses on people falling in love with new foods and milk pairings. Just like that, a high school teacher had ascended to dating coaching royalty. Jenn’s personable support system has proven remarkably effective and inspirational. For the past several years, she has assisted countless men and women wondering where to meet people, how to plan a date, and what to do once they’re in a relationship. Coaching, Event Planning, Date Planning — She Does It All! Jenn has a commanding presence as a dating and relationship coach. She gets to know her clients on a personal level and tells them how to change their dating patterns for the better. Her in-person coaching sessions motivate daters to go after what they want. As with any good teacher, she assigns homework to make sure her clients make progress between sessions. Additionally, Jenn’s concierge dating services provide people with a wingwoman for all aspects of the dating experience. From personal shopping consultations to online dating profile editing, she offers an incredibly varied selection of services for singles and couples. In 2017, Jenn became the spokesperson of the Got Milk? 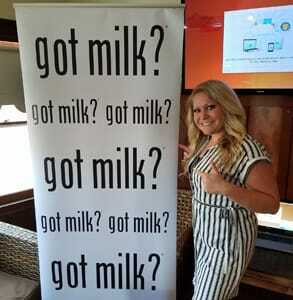 campaign and planned milk-themed events in Sacramento, which featured milk with a variety of foods. Jenn tailors her assistance to the needs of her clients and has planned many memorable romantic excursions and date nights. She can even arrange for a personal chef to cook you a gourmet dinner for two on Valentine’s Day or an anniversary. In her coaching business, Jenn is a direct and supportive companion to daters of all ages. She draws from her experience as a special-ed teacher to offer encouragement as well as behavior modification. Clients who work with her don’t just get advice — they get a shoulder to cry on and a friend to confide in because Jenn is in it for the long haul. Not only is Jenn a dynamic dating coach, but she’s also an experienced event planner. Her local events vary in theme — from speed dating on a Ferris wheel to party bus tours — and have entertained 600+ attendees from across California. She welcomes singles and couples into a comfortable atmosphere where they can enjoy themselves and build relationships of all kinds. Throughout her career, Jenn has built up an impressive list of accomplishments, including serving as keynote speaker at citywide events and teaching Dating 101 as an adjunct professor. But she told us her crowning achievement has been appearing as a guest on several local television shows. Jenn’s on-screen charisma, quotable tips, and heartfelt takeaways have made her Sacramento’s resident TV dating expert. Various news teams have recognized her authority in the dating world and sought her advice in informational segments about love and relationships. Today, she regularly appears on Good Day Sacramento, Studio 40 Live, The Morning Blend, and Sac & Co.
She told us she’s currently planning to star in a Lifetime reality show about her own love life. She’ll go on 30 dates in 30 days with a camera hot on her heels. It’s a chance for The Queen of Dating to strut her stuff and show singles how to tackle dating’s ups and downs with a positive attitude. At every event and in every coaching session, Jenn gives her all to ensure that people come away pumped up and feeling good. She started out in 2012 to make a difference in the dating world, and she has inspired many touching love stories along the way. Ryan, a recent Sacramento transplant, found the local dating scene tough to crack, so he reached out to Jenn for help. She was able to guide him to change his approach to dating. “Jenn helped me see dating in a different light. I recently got married on a yacht and, of course, Jenn was invited to attend,” he said. “My wife told me that a specific thing I did on our first date showered her I was different. I learned that from Jenn!” He recently recommended Jenn’s coaching services to his twin brother. Cheryl and Jenn went to high school together but lost touch as they both pursued advanced degrees in different fields. Then, when Cheryl saw her old classmate on TV, she got back in touch because she felt discouraged with the dating scene and wanted to try something different. She met Josh at one of Jenn’s themed singles events, and the couple hit it off. To this day, they send Jenn greeting cards to update her on their love story and thank her for bringing them together. Whether you’re looking to break into the local social scene or bring the spark back to your relationship, Jenn can accompany you on your journey and give you the tools you need to take that next step with someone special. Jenn’s journey from special education teacher to professional dating authority is far from typical, but the transition felt natural to her because it all had to do with sharing knowledge and inspiring positive changes in people’s lives. You can book an appointment with The Queen of Dating and start getting your love life back on track. The Queen of Dating embarked on a career as a dating coach and event planner because she knew there were so many singles out there like her — those who wanted to get in a relationship but lacked the means to do so — and she believed she could help them find romantic opportunities in everyday life. Today, Jenn enthusiastically plans romantic nights in and fun nights out for Californians seeking to spice up their love affairs. Her advice as a savvy dating expert gives hope to thousands of daters and empowers them to make the most of their relationships.